What better reminder than a beautiful Christmas Palm Tree which reminds you of the tropical sea-breeze on your last family vacation. Yes, the Christmas Palm, known botanically as Veitchia Merrillii, is that beautiful addition to your home, office, or patio. It’s an amazing palm tree for its adaptability of both indoor and outdoor use in both dim-light and full sun, the Christmas Palm Tree can do it! Originally the Christmas Palm hailed from small islands around the Philippines and soon after was shipped throughout the world! Since so many countries had different names for this beautiful palm, it commandeered several common names such as the Manila Palm, Kerpis Palm, Adonidia Palm, Dwarf Royal Palm, and Veitchia Palm. The common name given by us Palmhuggers has been the Christmas Palm, but for jolly good reason, as it develops beautiful red seeds usually twice a year which appear as bright red ornaments, typically around the first days of Spring and late fall, during the holiday season. Another great feature of the Christmas Palm is the manner which they are grown, multistem! So for all the Green-thumbs out there, who like to have more foliage, we also have double-stem Christmas Palms and Triple-stem Christmas Palms which are both grown for indoor and/or outdoor use. You will need to feed the palm a little more, but it’s worth it! Since the Christmas Palm easily adapts from different environments, same can be said of its watering cycles. The Christmas Palm can tolerate times of drought along with times of flooding. For indoor use, the Palmhugger’s recommend fully soaking the palm soil then allow the soil to dry out, once the soil is dry, allow to dry for 24 hours, before re-soaking. Then you’ll find the easiest way to find your watering cycle for your Christmas Palm. Better yet, add some Terrasorb and it will retain the watering longer, normally a full week between watering's. The Christmas Palm are known to grow a maximum average height of 15 to 20 feet and 20 to 25 ft when in a subtropical rainforest conditions. The Christmas Palm also can be cultivated many ways in order to slow it’s growth rate. 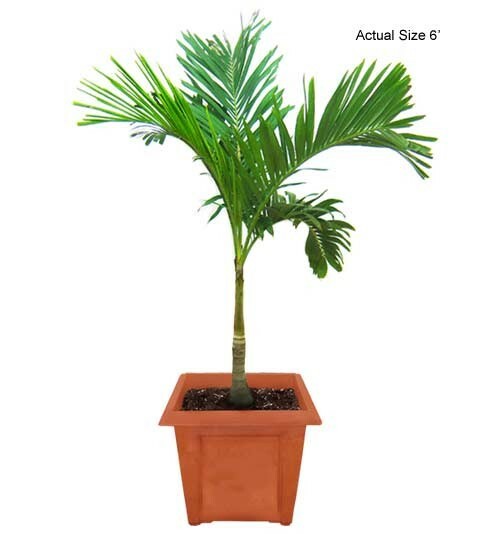 When placed indoors, the Christmas Palm typically they slow their growth rate down as their fronds and palm heart are adapting to their new environment. Whether the environment is near the couch or front foyer to being out on the patio or front entrance, the Christmas Palm’s beautiful arching green fronds will bring the sense of peace and relaxation. Here are some of our favorite locations for the Christmas Palm to add a splash of natural color while your detoxify and cleaning the air we breathe!The Christmas Palm can be used in both indoor and outdoor locations. Some unique places are the front foyer area to an office or home. Around the pool or jacuzzi, especially during spring and summer! Or a more formal setting like a lobby, or reception area. 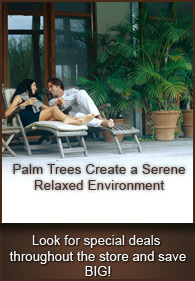 Whichever palm paradise is in your next project, the Christmas palm can help! For more photos of the Christmas Palm, visit our Christmas Palm Photo Gallery, it’s packed with vivid pictures of the Christmas Palm for indoor and outdoor uses!